IC Insider.com TOP 10 selections return after a break. The selections, are based on 2019 earnings. Quite a number of the 2018 TOP 10 listings appear again in this year’s lists. 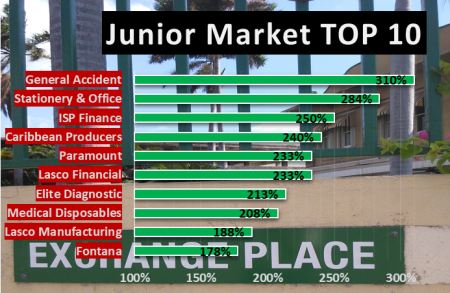 New to the Junior Market, are Fontana that was listed in December last year, Lasco Manufacturing, ISP Finance and Medical Disposables. 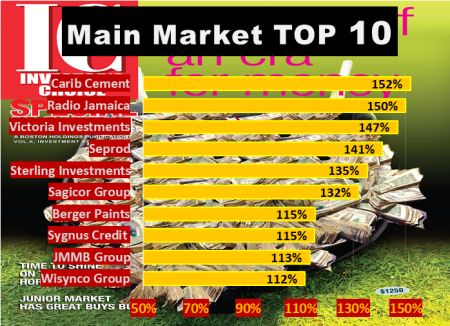 New to the TOP 10 main market list are Caribbean Cement, Sterling Investments, Radio Jamaica and Sygnus Credit Investments. The three leading Junior Market stocks are General Accident, with potential gains of 310 percent, Stationery and Office Supplies 284 percent and ISP Finance with 250 percent. 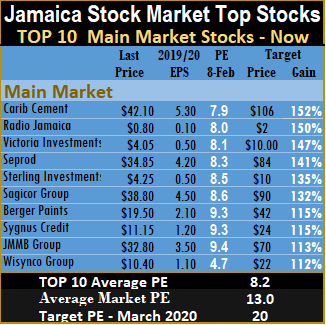 The three leading main market stocks are, Caribbean Cement with likely gains of 152 percent, Radio Jamaica, 150 percent and Victoria Mutual investments 147 percent. Fontana, is projected by IC Insider.com, to earn at 50 cents per share for the current year and should go on to boost earnings for the June 2020 much higher with the opening of its newest branch this year. The prospects for the stock is very good over the next two to three years with the expansion plans that the company has for it. Lasco Manufacturing’s profit for the December quarter was effectively flat at $197 million but is up a strong 32 percent for nine months period. With EPS at 17 cents for the year, to December, full year results could hit 25 cents per share with 2020 moving higher as new product lines deliver more sales and profit. ISP Finance has been gradually building the loan portfolio and reporting improved annual profits but investment in increased staffing to manage expansion has increased cost faster than growth in revenues. The company exhausted the cash on hand in 2018 and borrowed additional funds to expand their loan portfolio. 2019 should be the year that profit break out and justify the current stock price. Medical Disposables delivered improved results in the six months to September last year with increased revenues coming from the new consumer lines that have been added to the product range. 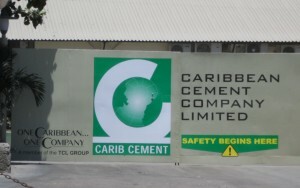 In the main market, the way seems clear for Caribbean Cement to break out this year with the plant upgrade now behind them and the discontinuation of costly import of cement to fill the gap left by lower production as the plant upgrade took place in 2018. The company will benefit from increased sales as the construction sector continues to grow and demand more cement to use in building. Sterling Investments’ share has been undervalued for sometime and remains so, even after a 5 for 1 stock split in late 2018 that help move the price up. Additional funds from a recent rights issue will place the company in a position to take advantage of other investment opportunities and boost profit. Radio Jamaica has not delivered on the improved profitability after merging with the Gleaner but with income showing some growth against an improving economy, the 2020 fiscal year could start showing improved results. Sygnus Credit Investments is an undervalued stock with earnings to the September quarter negatively affected by the slippage in the rate of exchange of the local currency. Exchange movements does not affect the underlying fundamentals of the company going forward. The main market closed the week with the overall PE at 13 and the Junior Market at 10. 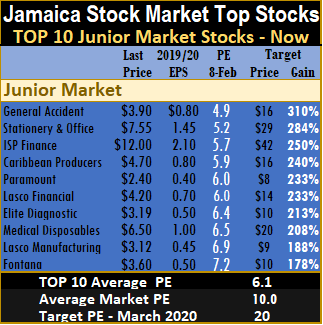 The PE ratio for Junior Market Top 10 stocks average 6.1 and the main market PE is now 8.2. The TOP 10 stocks now trade at an average discount of 39 percent to the average for the Junior Market Top stocks but it’s a third of what the average PE for the year is likely to be of 20 times earnings. The main market stocks trade at a discount of 37 percent to the overall market.